Wow, two weeks since the last post. While everyone else is kicking back and enjoying the summer, I’m right in the middle of my busiest time. Summer is the only time I have access to the lab and classroom PCs. Plus it’s the time to weed out old student accounts and files and create new ones. Add to that my two college courses and things get a bit tight. We’re redoing plans for trips this summer so I can spend more time here and less traveling. Not an easy choice, but it will give me more time to use later in the year when things aren’t so hectic (he said hopefully but perhaps foolishly). Hitting the books again is taking some effort. It’s been 11 years since I’ve had to do homework. Neither course is particularly difficult, but they’re both time consuming. I’m hoping the payoff is worth the effort. Nice weekend coming up. Time for a trip to St. Louis. Trader Joe’s is calling my name. 😎 So’s the lawn, unfortunately. 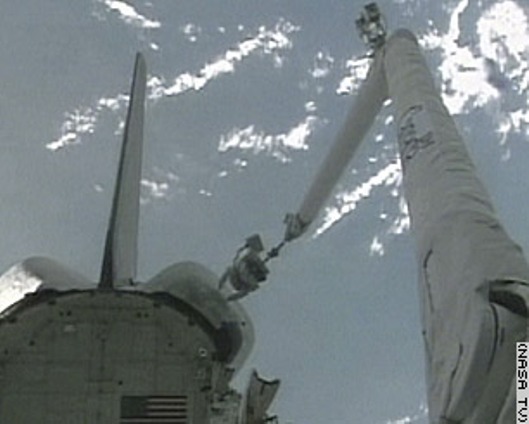 As if climbing into a semi-reliable spacecraft sitting atop a million pounds of explosive force and hurtling into space weren’t ballsy enough, this guy agreed to be attached to a huge robotic arm by his feet and be foisted out on his own toward the shuttle tail to repair a thermal blanket. And if he screws it up, well, you don’t get home. Talk about guts. New family in the neighborhood. Mrs. Racoon and the younguns have moved in. Hope they’re quiet neighbors. Jobs I could do as well as the pros. 2. Relief pitcher – I could easily throw four balls or lob a home run ball to end a game. I’d do it for half the money the lowest paid MLB pitcher gets and smile all the way to the bank. I know damn well I could throw a baseball from 20 feet in front of home plate to the first baseman close enough for him to catch it. Are you listening, Mike Timlin? 3. Copy editor – Ok, maybe this one is not so easy. I suppose you could really get burned out reading so much drivel. But I’ve seen one too many tpyos, grammatical errors what any kid would know, and, excess, commas, that slipped by folks whose careers revolve around getting it right on paper. 4. Traffic engineer – I can’t remember the last time I saw a properly timed series of traffic lights. Champaign is definitely in need of a good traffic guru. Neil St comes to mind. Indianapolis is another nightmare that needn’t be. Maybe cities are too cash strapped to afford traffic engineers. If so, my apologies to the profession. 5. Sporting event TV director – I was watching the Formula One race from Monaco (Monte Carlo) a few weeks ago and the French TV feed director kept missing important racing action to show the faces of the mechanics in the pit lane. I mean repeatedly. It would have been comical if he hadn’t missed so much on-track action. And then during a recent Red Sox/Yankmees game, we got to see a close up of Alex Rodriguez’s face over and over and over. Plus we got to hear about his antics through the entire show. Maybe A-Rodent owns a big piece of ESPN, who knows. …I stepped off a bus in Ft. Knox, KY. I was a nervous, long-haired, pig-headed kid. It was the beginning of my true education. Boot camp tends to focus the mind and relieve one of the notion that the universe revolves around you. I had some hard times and some really good times during my 8 years of active duty. I was always on the verge of being broke, but always made it through somehow. I saw parts of the world I wouldn’t have otherwise seen and I saw the dark side of government in places like North Korea and East Germany. I learned how not to be the Ugly American by a little trial-and-error and by watching some folks who were truly gifted at being UAs. I learned that one really needs to be a good citizen of the world in order to be a good citizen of one’s own country. I met many people who were at once thrilled by, mistrusting of, and resentful of all things American. I learned that the vast majority of the world can separate Americans from America; the people from the government. And all that education started with a drill sergeant screaming at me from an inch away just because I was a “cruit.” I can still vividly recall my drill sergeants’ faces because I was within inches of them so many times and had ample opportunity to study every detail. When a drill is screaming at you, you had better not avert your eyes. One of these days I’d like to drive down to Ft. Knox just to see the place where my life took such a momentous change in direction. While I’d never want to go through that again, it was the best thing that ever happened to me. And if, by chance, a drill sergeant (any drill sergeant) happens to read this, I want to say thanks. I owe you. Today we made our semi-annual sojourn to the Book Barn in Niantic, CT. Fascinating place with thousands of used books and numerous cats. It was such a gorgeous day, we decided to do a little sight-seeing afterwards. I’d driven by Mystic Seaport more times than I can count during my truck driving days, but I have never actually been there. The “seaport” is actually a museum spread out over several acres along the waterfront. Without paying to get in (which we chose not to do today), it’s hard to get any really good shots of the ships and such, but we did what we could. The town of Mystic is also pretty quaint, but we saw no quick and easy parking, so we continued on our way. Nice place to spend a day if you’re ever in the area, though. Sarah was giving a workshop at Western Massachusetts Regional Library System (WMRLS) near Deerfield, MA today, so I had 3 hours to spend in the area. I went in search of a cup of coffee and almost immediately ran across the entrance to Mount Sugarloaf State Reservation. I had seen the observation tower and access road from the WMRLS parking lot and it looked like an interesting place to check out, so I went on up. Aside from a park maintenance person, I had the place to myself for an hour or so. I kept waiting for the clouds to lift so I could get some decent pictures, but they never did. So I took what shots I could. Nice place, though. Tables and BBQ pits are scattered around the tower at the top and there are several trails for those with more ambition than I.
We’ve covered a lot of sidewalk miles during our stay here in New Yawk and with that distance comes a wealth of knowledge and experience. Successfully navigating along crowded sidewalks requires keen observation, instant and correct classification of other sidewalkers, and the proper avoidance technique for any given classification. Otherwise you spend half your time bouncing off people or trolling along helplessly behind them. So in the interest of aiding future visitors to this fair city, I’ll impart some hard earned knowledge of the various classifications of sidewalkers. 1. The Tourist – Very common in Manhattan. Usually identified by the camera hanging around the neck, a distant look in the eye, and a tendency to be looking up at the tall buildings. The Tourist is apt to stop suddenly or change direction with little or no warning. Easily avoided by yelling, “Oh, look” and then scooting by them when they stop to look around. 2. The Zombie – While the Zombie can found almost anywhere in the city, it is seen with greater frequency in the Greenwich Village neighborhood. The Zombie usually plods along in a straight line with an unfocused and blank stare, a gaping and possibly drooling mouth, and a general disheveled appearance. Incidental contact with Zombies should be avoided at all costs. Simply step aside while they pass. 3. The Herd – Often, but not always, comprised of multiple Tourists, The Herd is upwards of four adult sidewalkers with large cabooses walking slowly and side-by-side. Herds will oftentimes span the entire girth of the sidewalk and create a backup of considerable numbers of other sidewalkers of all classifications. Should one become trapped behind a Herd, the best practice is to observe their movement for the slightest gap in their line and hustle through without looking back. 4. The Drifter – This commonly found sidewalker simply cannot walk in a straight line. They tend to drift at irregular intervals from left to right and back again. Successful avoidance requires a bit of observation to estimate the timing of the drift and quick action to pass while the Drifter is in mid-drift away from the side you are passing. 5. The Clogger – This arrogant beast trolls along looking for any existing bottleneck along a sidewalk and, upon finding one, will stop directly in the narrowest point, thereby completing the blockage. Cloggers can occasionally be forced out of their bottleneck by the pressure of the resulting sidewalker backup, or sometimes the pressure will force an opening in other parts of the existing bottleneck. 6. The Stringers – This group is similar in nature to The Herd, except they walk in a oblique line. Most often The Stringers are a cohesive unit such as a family or school group. Avoidance techniques are similar to those used for The Herd. 7. The Bull – This ornery critter is the one most likely to cause injury. The Bull is most often a large male who leans forward into his gait and lets gravity take its course. The Bull will change direction for no one and will not be slowed by downed sidewalkers. The Bull is to be avoided at all costs. Avoidance technique is similar to The Zombie, but must be taken with alacrity. A dangerous, but thankfully rare cross-breed is the Drifter/Bull. Be especially wary of these. 8. The Borg – Utmost caution is required upon encountering The Borg, or you will be assimilated. The Borg are easily indentified by the chintzy, plastic ear attachment used to communicate with other Borg. Female Borg are sometimes difficult to identify on sight due to the hiding of their implants by hair, but as one closes in, one can notice the Borg taking to no one in particular. Less advanced Borg can still be spotted holding older-style, clamshell communicators in front of their faces. The Borg are apt to stop suddenly when the conversation with other Borg becomes intense. This is your opportunity to pass. Listen closely for the rise in tone and you’ll be ready when the time comes to scoot by. 9. The Lost Model – Except in The Village, LMs are slightly built females wearing tight clothing of limited fabric and very high heeled shoes. Note that the non-female variety seen in The Village will be similarly dressed. LMs are looking for their catwalks and as such often exhibit either a confused, slightly scared look, or a perplexed/perturbed look. Even the slightest contact with an LM can cause breakage, crying, and condemnation. Walk softly around them. 10. The Lost Model Wannabe – Similar to the LM except of significantly larger build. Sightings of LMWs have been known to cause nightmares or hysterical laughter. 11. The Swag Bagger – The Swag Bagger is most easily identifed by the “Hi, my name is…” badge affixed to their clothing or hanging around their necks and by the numerous bags of swag they’ve accumulated at whatever conference they happen to be attending. It is common for Swag Baggers to travel in Herds, thereby making them difficult to avoid. If you should find yourself between a Swag Bagger and a conference shuttle bus, leap out of the way as quickly as possible, even if it means diving into traffic on the street. 1. You can wear anything you want and no one will take notice. We had dinner last night down in The Village and saw so many truly bizarre people that after a bit, they began to look like the norm. This morning I saw a very old man riding a newish mountain bike beside the sidewalk of a very busy street. He was weaving in and out of taxi cabs and buses that were also weaving in and out of parked vehicles and pedestrians. I wouldn’t last 5 minutes on a bike here, yet this gentleman was successfully negotiating the obstacle course. Amazing. This city truly is a free for all. 2. I’ve been on subways in many cities, including several in Europe. All of them are better designed and easier to use than NYC’s subway system. Last night we took the subway back from The Village area to Columbus Circle. We only needed two passes, yet none of the machines we tried would take my credit card or dollar bills. We finally found a manned station. I told the attendant I needed two tickets and he took my money and gave me one subway card. No explanation. So we went over to the turnstyles and tried swiping the card, but it wouldn’t let us pass. Finally after swiping the card twice, I was able to pass through. Then I had to hand the pass back to Sarah and she had to swipe it twice. What’s wrong with tokens? Then began the fun of trying to figure out which trains to take. The map was easy enough to figure out, but trying to decide which train corresponded with what we saw on the map was not as easy. We made it back somehow, but I can see you’d have to live here awhile to really get to know this system. 3. The restaurants here are on a higher plane than in the Midwest. Simple neighborhood eateries have delicious food. You can hardly find a bad meal here (except maybe at our hotel). 4. Most signs warning of fines for driving offenses mean nothing. There are signs everywhere warning of hefty fines for honking horns, yet you stand there reading the sign while a symphony of honking horns plays around you. I was sitting in a stationary cab last night right in the middle of an intersection reading the sign warning drivers about blocking cross traffic. The lines on the street? They’re there for visitors. No one else pays any attention to them. And the shuttle bus drivers move through the tightest gaps in traffic with the grace of ballet dancers. I kept waiting for the crunch of metal, but we never hit a thing. 5. Tall buildings always appear a lot closer than they really are. I left the Javits Center yesterday around 1PM. The shuttle buses had stopped running and I had very little cash, so I had no choice but to walk back to the hotel. There’s a very distinctive building near our hotel and I could see it easily from the Javits Center. I thought, “that’s not so far.” Half an hour later I could still clearly see the distinctive building whenever I stopped to wipe the sweat off my forehead. On a cool day, it would have been a nice walk. In yesterday’s heat, not so much. 6. If you’re tired enough, you can sleep through anything. The first night here I may have slept 3 hours total. The rest of the night I was kept awake by the seemingly non-stop truck traffic on W. 57th St and by the near constant slamming of hotel room doors (why can’t someone invent a door that closes securely without slamming?) and by the ice machine that some fledgling architect thought would be ok to put right in the hallway outside our room. But after a busy day yesterday combined with a serious sleep deficit, I slept like the dead last night. 7. The price of bottled water fluctuates wildly with the location of the purchase. A small bottle at our hotel bar runs $4. It’s $3 at the convention center. At the Subway sandwich joint around the corner from our hotel, it’s $1.25. Sort of like shopping for the cheapest gasoline, which, btw, is not much higher here in the city that it is in our neck of the woods back home. 8. As I sit here looking out my hotel room window, I have to think that glass is the most common element in NYC. And I wonder how high up you have to get before you stop hearing traffic. I can tell you that 12th floor is not high enough.